Before she left for her shift at the shelter today Mrs J put in a dinner request: Roasted BBQ chicken. I did a semi spatchcock job on the bird, cutting out the backbone but leaving the breast bone in. At the last minute I took some of my frozen garlic cloves and inserted them whole under the skin on the breast and the legs – you can see the lumps there under the skin. It had a wonderful taste but it looks kind of gross, “like tumors” one fellow said. Thanks, Cy! lol I brushed olive oil on the skin and sprinkled on kosher salt and slid it into a 350 oven. As it was nearing done I coated it with BBQ sauce. That slaw has a pretty good tang to it – there are jalapenos and habaneros in there along with a few lesser peppers. 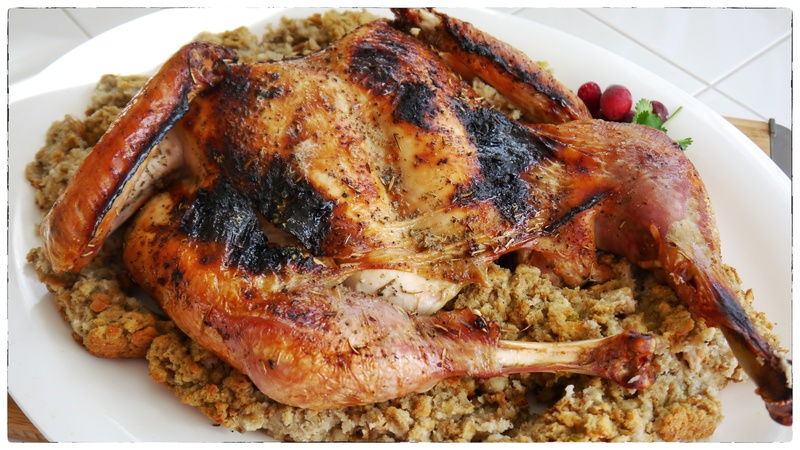 I was hanging out at a blog last night, reading comments and enjoying the tomfoolery when a commenter asked about roasting a chicken. Plenty of advice to be found about anything at that place, some of it reasoned and considered. A fellow mentioned spatchcocking the bird. I usually do a semi spatchcock-I take out the backbone. 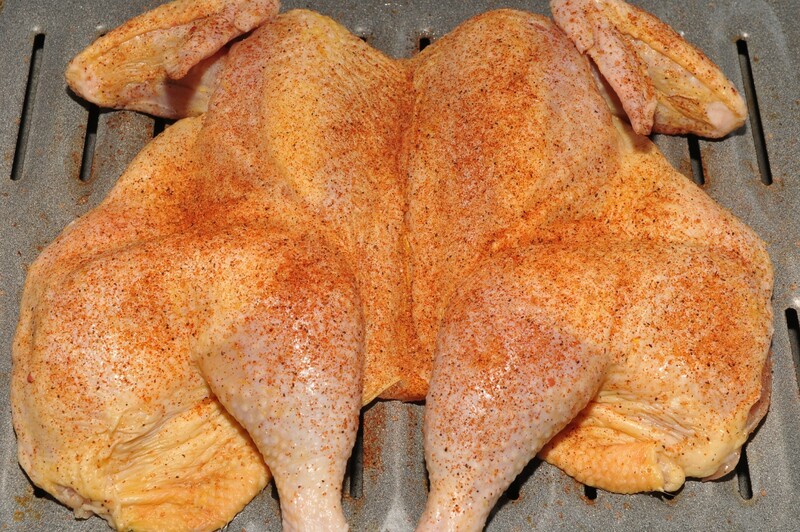 The breastbone comes out in the “full spatchcock”. Anyway, he left a link to a “how to” page. I was inspired to go all the way today. 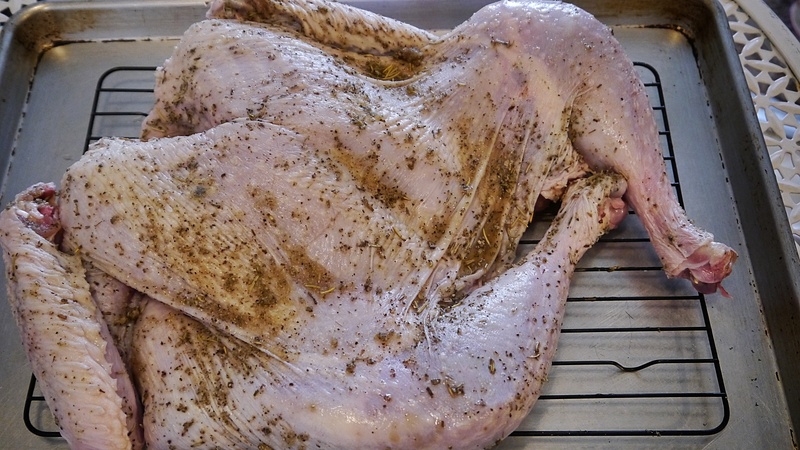 Here we are with the bird splayed out on a roasting pan, some Cajun spices sprinkled on. Ready to go into the oven at this point, but I’ll wait a bit. Mrs J will be home in a few hours so to the fridge it goes for now. 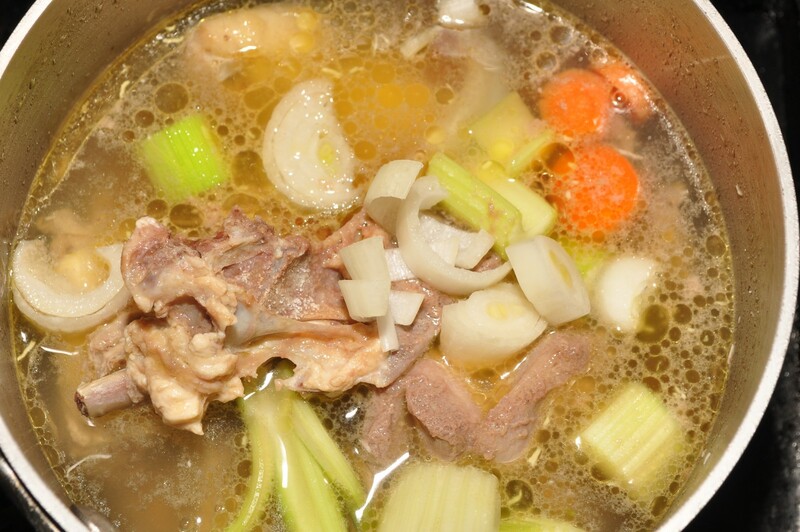 Toss the bones into a sauce pan, along with the liver and gizzard. Cover with water, add some salt and a few veggies for flavor and simmer for a while. Save the stock for the next time you need some. The dog boys just love the boiled bones-nothing there that’s a danger to the dogs.